A request concerning these old houses at Fourth and Calapooia has been removed from Wednesday’s agenda of the Albany urban renewal board. 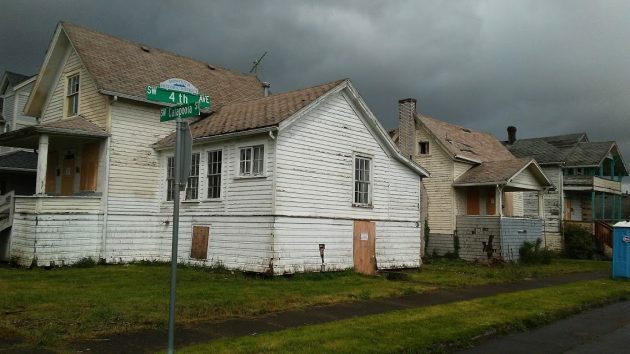 A million-dollar funding request to help preserve three derelict old houses in Albany’s Monteith Historic District has been pulled from Wednesday’s agenda of the Central Albany Revitalization Area’s advisory board. City Hall announced the agenda change in an email this morning without an explanation. Mark Siegner, the Albany builder who proposed restoring the houses with CARA’s support, had not yet been informed of the change when I talked to him about 10:15. Siegner and his wife Tina, owners of Valley Homes Inc., bought the tax lot containing the three condemned houses in February with the view either to restoring them or replacing them with new construction. He told me today his first thought was to tear the buildings down. But when he approached the Albany Landmarks Advisory Commission he learned the members would prefer the buildings be restored, and the commission would challenge him on any demolition plans. He then applied to CARA for financial aid in a restoration project. The houses, at least a century old, had been neglected for decades and were in such bad shape that rebuilding them would require taking them down to the studs first. To do this and also build four garages and two apartments in the back of the lot would take nearly $1.5 million. His request to CARA was for a $500,000 loan over 15 years plus another $500,000 that would become a grant upon completion of the work. “But when he approached the Albany Landmarks Advisory Commission he learned the members would prefer the buildings be restored, and the commission would challenge him on any demolition plans.” It never ceases to amaze me that people in a fantasy world of imagined importance would rather see these “historic ?” blight ridden houses be left to fall down from rot, and continue to be used for drug use and the Lord knows what else instead of allowing these people build something new and USABLE in their place. What makes these rotting houses so historical other than they are old??? I just don’t get it sometimes. Let these people put in something that can be used. I really think that if the Albany Landmarks Advisory Commission is going to fight these people tearing them down, requiring them to remodel, then they, not CARA should help foot the bill. Just my opinion. Also on tonight’s CARA agenda: Edgewater Village asking to increase their loan subordination limit by $5 million, which would bring it to $11 million. They asked for and were granted a $5 million increase last February. According to the Linn County assessor, it seems only one house in the subdivision is owned by someone unrelated to the developer. They are trying to sell homes for $70/sf more than other homes in the neighborhood, and the homes have been on the market for ~9 months longer than others in the same neighborhood. A good risk for Albany to take? We had to destroy the village in order to save it. Too bad. When restored to their !900’s appearance these modest houses would be attractive to home owners and would be a major addition to Albany’s collection of historic buildings. Moaners and groaners should recall that CARA is not using your tax money. CARA has borrowed the money and will be paying it back because it’s mostly a loan. CARA will also receive significant TIF tax returns from the increased value of this property and neighboring properties. I admire the Siegners for taking on this controversial, mis-understood, but much needed project. CARA uses for collateral for those “loans” the money collected from taxpayers since 2001 that is the raise in taxes in the accumulated years since 2001. That money above the 2001 freeze point is collected from taxpayers and goes to CARA…not schools, fire, police, etc. Since the new owner is going to tear it down and build new housing if they DON’T get CARA money, how is CARA going to generate increased taxation value? The value will be enhanced either way. Where does the $500,000 GRANT come from, other than the taxpayers/residents? Ahh, the truth rises. My take is that the developer made a reasonable buy for a lot that contained zero-value derelict buildings; then he sought an opinion from the Landmarks Advisory quasi-govt group who want a showpiece reconstruction at somebody else’s cost. Pitching that approach to CARA actually shined a light on the bad deal being pushed upon him. The Landmarks group needs to understand that, while it’s theoretically possible to resuscitate a cadaver, there’s a significant cost. The Landmark Advisory Commission has apparently been hijacked by people whose true motive is not to preserve where appropriate, but to stop positive change. At some point the City Council has to step in and restore sanity. Did the citizens of Albany elect the no-doubt pleasant folks to the Landmark Advisory Commission or are Commission members more likely to be examples of self-selection? The citizens who volunteer for these bodies are, by their very nature, interested in the topic the commission regulates. The proposition that these commissions are supposed to represent the interests of ALL Albanians is a false one because of who ends up sitting on the commission and th narrow scope of their charge. I realize the Council must rely on these volunteer commissions. However, when the Landmark Advisory Commission indicated it would fight to preserve a faux historical sensibility when the three buildings in question must be torn down to the stud walls and be rebuilt, it is time for the Council to reexamine Commission authority. The Council must rebalance the stated goals of this commission to create realistic conditions so that property owners can move forward without threat. All seven members are appointed by the Mayor. Their authority is limited to advising and recommending. They act through the city council. The council can stop the insanity if they choose to do so. The buildings are in a historic district, and from a brief look at the City of Albany’s historic preservation site (https://www.cityofalbany.net/departments/community-development/historic-preservation/historic-preservation-program), it seems it’s the LAC’s job to review any request to demolish or substantially alter the exterior of property in these districts. We have the developer’s take on the interaction with the LAC – would be nice to hear the other side as well. All the city committees and commissions are appointed by the councilors and/or mayor. They put out a misleading plea in the newspaper at the end of each year saying they are taking applications for these commissions, etc. That is a fraud. They “take” the applications and file them in the “round” file if they want to. They can appoint whom they want, and they do so, so the people on committees and commissions are cronies of the councilors and the mayor. You get the picture, I’m sure. Follow the money! The $500,000 comes from money CARA has BORROWED to rectify blight. It will be payed back from the increased taxable value of this and surrounding properties . Until public funds are used to house and support the people displaced from these homes, no public money should be spent on their development.